The New York Rangers, the East's number one seed, had their hands full in a seven game series against the eighth seeded Ottawa Senators. The Rangers avoided elimination in the final two games before they eliminated the Senators in a thrilling game seven. The Washington Capitals needed seven games as well to knock of the defending Stanley Cup Champion Boston Bruins. The Washington Capitals have several story lines developing and spilling over into the second round. The biggest of the two is rookie, Braden Holtby's, carrying the Caps through the first round and outmatching Tim Thomas. The second and more controversial, Alaxeander Ovechkin's ice time. Ovechkin was benched during game five, and got very little ice time in game seven. The Rangers were able to escape a monumental upset by the hands of the young and speedy Senators. Henrik Ludqvist anchored the Rangers between the pipes with a 1.70 goals against average, and denying the Senators on several flurries late in game seven. Rangers' Brian Boyle, who has scored three goals in the playoffs, suffered a concussion in game five, and practiced for the first time on Friday. Reports have said he may be available for game one on Saturday. Capitals' goalies Tomas Vokoun and Michal Neuvirth went down with injuries before the playoffs but Holtby's play has taken the worry out of that scenario. Can rookie Holtby out duel another world class goalie in Lundqvist? Doubtful. With that said, the Capitals' Ovechkin and Alexander Semin will have to step up their offensive production. Ovechkin only scored twice and Semin netted three goals through seven games. It will be hard to improve their offensive numbers against the likes of Lundqvist. 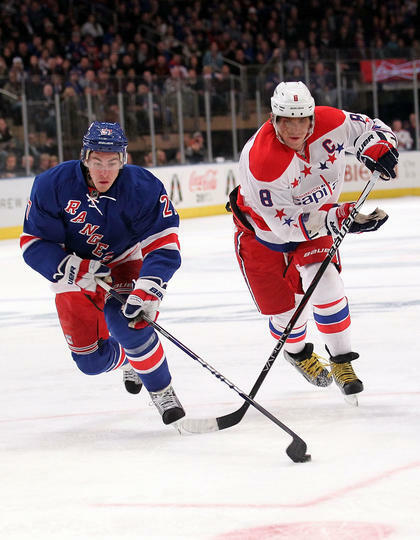 The Rangers should have an easy time against a slower Capitals team, which could help the production of Marian Gaborik and Ryan Callahan who have only recorded three and four points receptively. Many are still recovering from the the Philadelphia Flyers' series against the Pittsburgh Penguins. The Flyers finished off the Penguins in six games, and averaged five goals a game in that series. While above average goaltending has grabbed the spotlight in most of the first round match ups, sub-par showings were the storyline in that series. A total of 56 goals were scored in the six games between the Pens and Flyers. The New Jersey Devils were the last team to clinch a birth into the second round, and they needed to overtimes in their game seven against the Florida Panthers to do so. 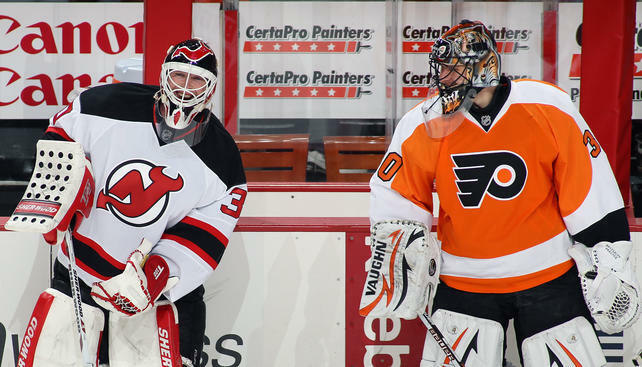 Martin Brodeur has shown flashes of his younger self early in the playoffs. Brodeur has a goals against average of 2.06 and a shutout victory in game four. Reports say the Flyers' Nicklas Grossmann and Marc-Andre Bourdon will not be ready for game one of their series on Sunday. The Devils are healthy and ready for puck drop. If the Devils want any chance at winning this series they will have to keep Claude Giroux at bay. Giroux scored six goals and recorded a playoffs' best 14 points through the first round. The Penguins had troubles handling Giroux who did everything from score to drop Sidney Crosby for the Flyers. The Flyers will also need the strong push from rookies, Brayden Schenn, Matt Read and Sean Couturier to continue. After getting the first series win of his career, Ilya Kovalchuk has to be itching for more. He has averaged 25:42 of ice time a game, which is the most among forwards, and has recorded three goals and five points through the opening round. However, if the Devils want to win, they will have to learn to play with a lead, they blew leads in games six and seven and narrowly escaped with wins in those games. The play that will decide this series is in net. If Ilya Bryzgalov continues to play like he did in the first round, where he allowed an average of just under four goals a game, he will make it hard for the Flyers to make it out of the series. With Martin Brodeur in net anything is possible, he has showed his age of late but with his past I wouldn't put a Stanley Cup worthy performance past him.